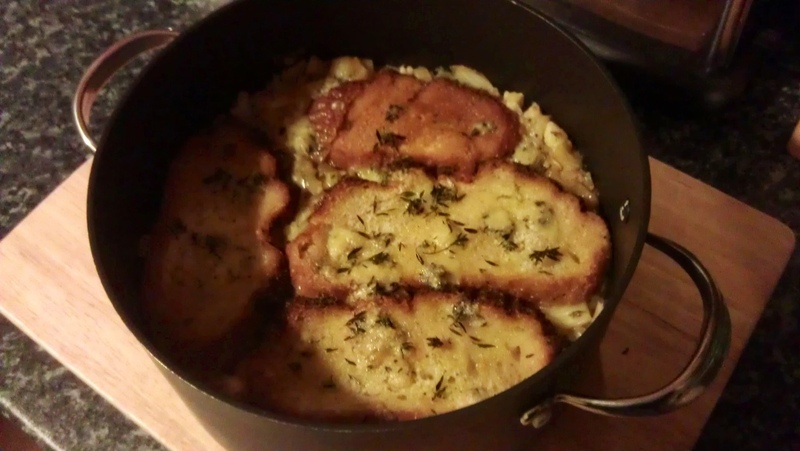 What else do you need on a cold winter’s night but a big bowl of comfort? 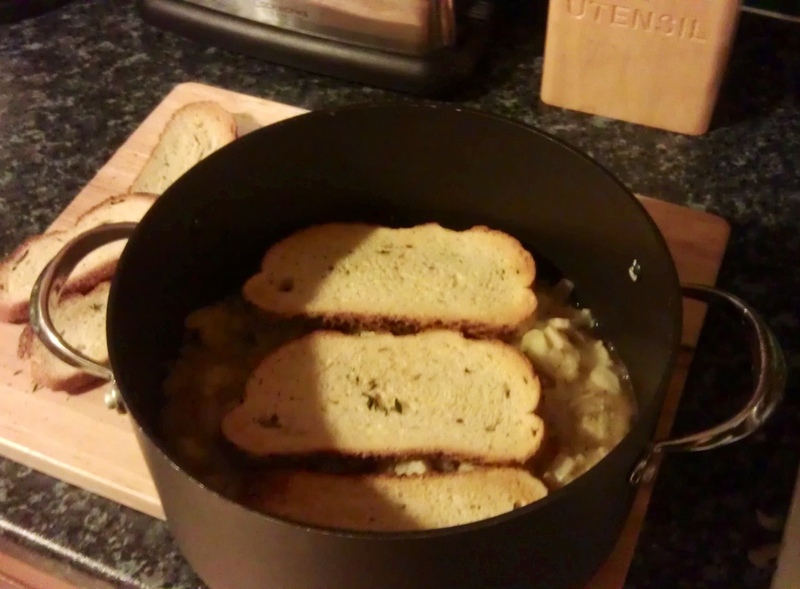 And this soup from Jamie’s Great Britain series really delivers. Hearty cauliflower, warming broth, golden bread and bursts of melted Stilton make you look forward to each bite more than the last. Even though it may seem like a lot of work, the steps themselves are quite simple and the layering and baking at the end is more than worthwhile, turning the soup into something that more resembles a savory bread pudding. Sauté the thinly sliced stalks in butter with thinly sliced white onion, thyme and a splash of water. It’s important to sauté the stalks on their own first so the florets, when you add them with the chicken stock after about 30-40 minutes, retain their integrity throughout the rest of the cooking process. Mash some of the stalks to thicken the soup slightly, then add the florets and chicken stock to cover. 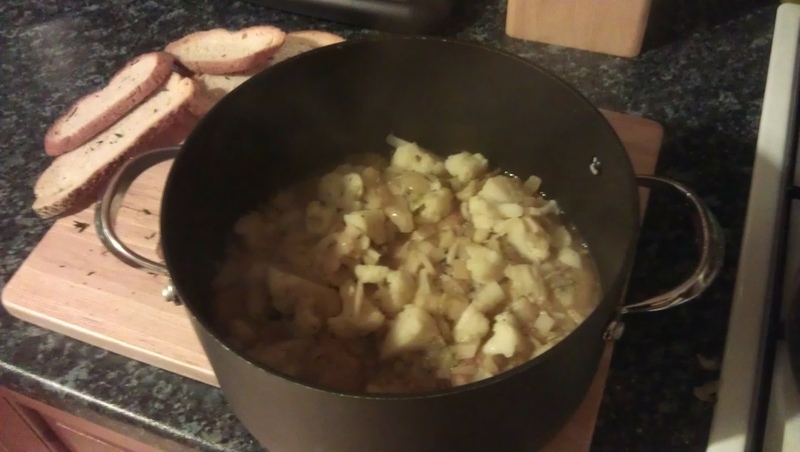 Simmer everything together until the florets are al dente. Toast enough bread to make three layers in the dish you choose to bake it in. 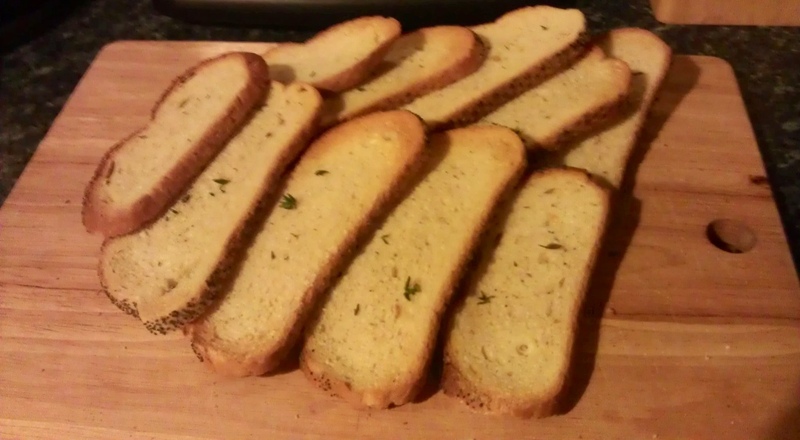 Although it might seem inconsequential, rubbing the hot toast with rosemary (or thyme in my case because I didn’t have any rosemary) will be a minute of your life well spent. The hot toast is so receptive to flavor that the herbs really make an impact, making the whole kitchen smell like Thanksgiving dinner. Once you have the soupy cauliflower, toast and Stilton ready for assembly, just layer them up and bake until golden and bubbling. 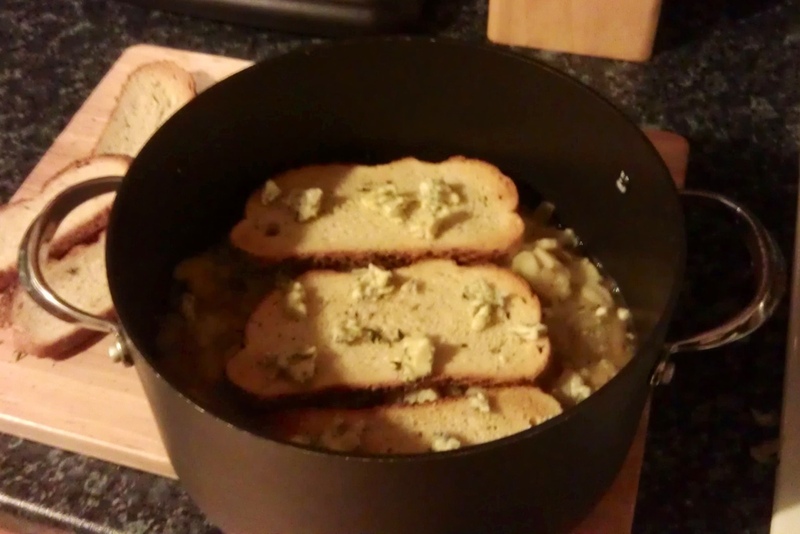 Don’t add too much Stilton or it’ll overpower everything. Small crumbles scattered across each layer is enough to give a lovely blue cheese ‘hum’ as Jamie calls it. I didn’t have any bacon, so I left that out, but I’m sure it would only enhance this dish (as pork products usually do). Also, I didn’t have any gentleman’s relish, but a quick online search revealed it to be a kind of spicy anchovy paste, so I just put in a good squeeze of anchovy paste and a pinch of dried chilli flakes. Be aware that eight servings, as the recipe claims to make, would mean about a ladle-full per person which is definitely not enough for greedy guts like me. I think the amount I ended up with will make about four good portions. All in all, simple, comforting and tasty. Jamie’s done it again. You know that you are going to have to make all these things when you come home! Mama is waiting with a hungry tummy!